Under the 1987 Constitution, party-list groups exist to give voice to marginalized sectors. Among those sectors is the youth, and because of this there are party-lists vying for seats in the 2019 Mid-term elections claiming to represent the Filipino youth. Most notable is the Kabataan Party-list, which holds a solitary seat in the House of Representatives and represented by Sarah Elago. The Duterte Youth, founded by current National Youth Commission chair Ronald Cardema, has also launched its own party-list and is aiming to win youth votes in the election. Banking on pop culture, a newly-formed party called “Ang Probinsyano” has also been launched and have recruited prominent celebrities to join its ranks. The group has also launched a youth arm to specifically target young voters, although the purpose of their party-list remains nebulous. While on paper it seems that the market for youth votes is saturated, it can be argued that only one – Kabataan Party-list – genuinely advocates for the welfare of young Filipinos. Rep. Sarah Elago, the Kabataan Party-list’s sole representative in the 17th Congress. First winning a seat at the House in 2007, the youth-focused, progressive party has consistently been a dissenting voice when issues pertaining to the youth, such as the hiking of tuition fees in state universities and colleges, arise. As early as 2011, the party proposed legislation that would prohibit the “no permit, no exam” policy of schools. This is a measure that would bar students from taking their final exams, regardless if they are doing well academically, because they have not paid in full their respective tuition fees. Their representative at that time, Mong Palatino, argued that the “no permit, no exam” policy is detrimental to young people as it causes them to fail their courses (despite having excelled prior) and also being subjected to humiliation. Facing push-back from successive governments, as well as their colleagues in Congress, does not deter the group and they continue to advocate for the banning of the anti-student policy in their successive stints in Congress. In the present 17th Congress, a new iteration of the said bill has been filed by its current representative Sarah Elago, proving that they are relentless fighters for the right to attain an education by the youth. The cost of education is also a big issue for the youth, and the party-list were among the most staunch critics of the previous Aquino government’s move to introduce the “K+12” curriculum – which added an additional two years to basic education requirements, meaning added expenses for parents. Kabataan Party-list repeatedly questioned the program’s basis, as well as its hasty implementation, back in 2012. During the 15th Congress, Kabataan Party-list through Palatino also proposed House Bill (HB) 1961 or the “Private School Fee Regulation Act”, which aimed to control the rapidly increasing school fees in private schools. (READ: HB 1961) Then, in the current 17th Congress, the party-list through Elago again proposed a similar measure aiming to stop planned hikes in tuition and miscellaneous fees. Photo from Kabataan Party-list Facebook page. From these examples, we can see that Kabataan Party-list have been consistent in their crusade to make education accessible and affordable for young Filipinos. They may change their representatives in Congress, but their principles and policies which they push retain their progressive theme. 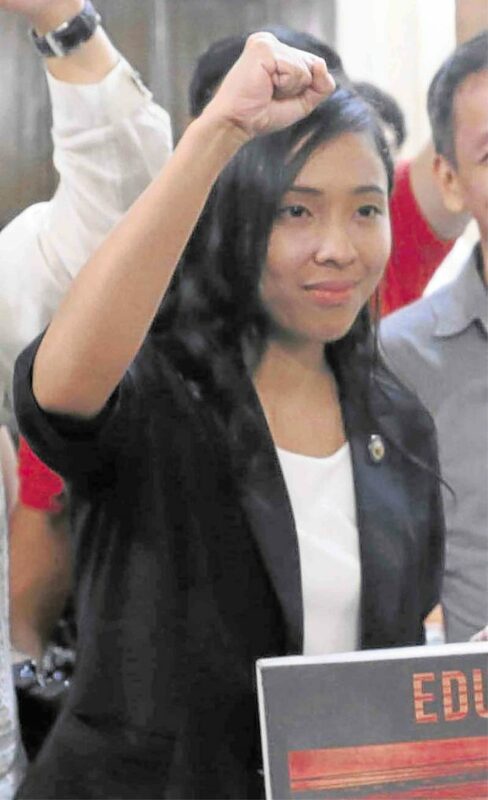 In contract, the Duterte Youth Party-list is pursuing a different avenue. They have actively sought the reinstatement of mandatory ROTC program in colleges, and mandatory CAT program in high schools. The Reserved Officers’ Training Corps (ROTC) is a military training program that hones a reserve force for the Philippine Military, while the Citizens’ Army Training (CAT) is a similar, but preparatory-stage program introduced in high school to ease students’ transition into the ROTC regime. In short, the Duterte Youth are proposing measures to militarize youth under the guise of “instilling patriotism and discipline”. But wouldn’t making this program mandatory only add to the burden already faced by students? It is similar to the K+12 scheme, albeit in this case the skills being taught are so niche it would be doubtful if a majority of the cadets enrolled in these training regimes would ever make use of them. 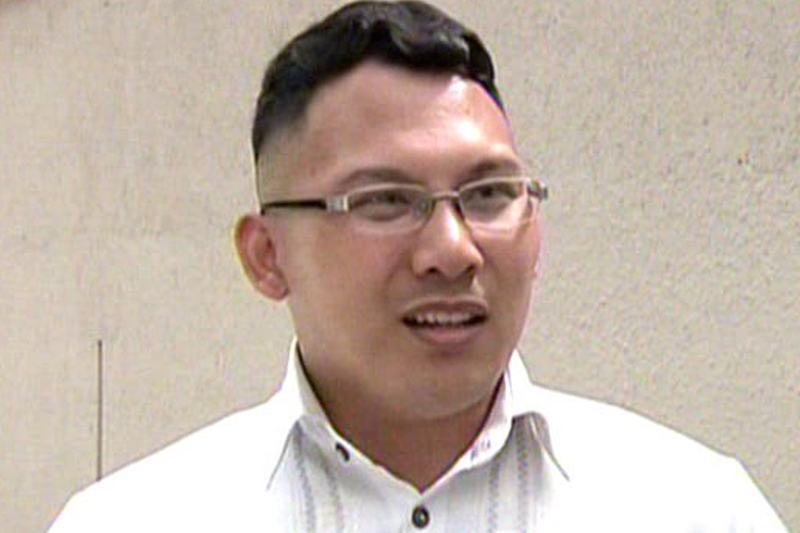 Current National Youth Commissioner Ronald Cardema is one of the founders of Duterte Youth. Being a cadet of also creates added expense for students, including uniforms and other materials used in the training, all for a program that not all of them would’ve signed up for in the first place. This makes the Duterte Youth polar opposites to Kabataan Party, one is calling for less costs on students but the other one is proposing measures to add to the workload of students. 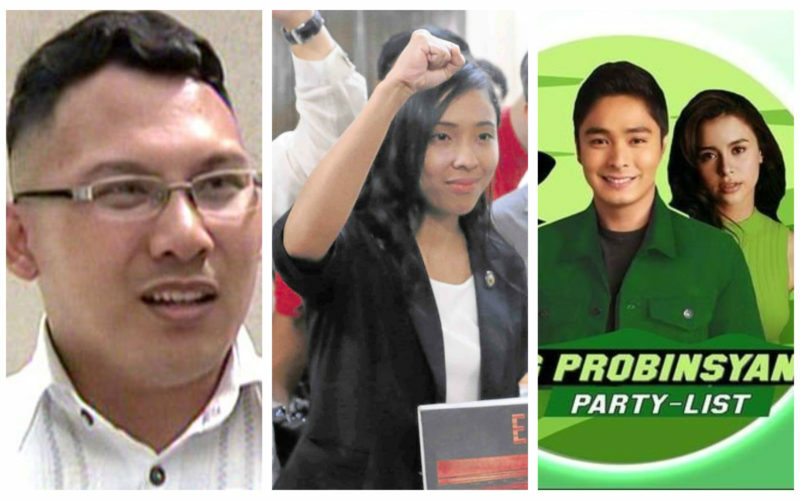 Meanwhile, the “Ang Probinsyano” party-list is a newly-formed group that is coat-tailing off the back of the popular TV series of the same name. The group is making it clear they want to bask in the publicity of the pop culture trend by even adopting the series’ two main stars – actors Coco Martin and Yassi Pressman – as its endorsers. 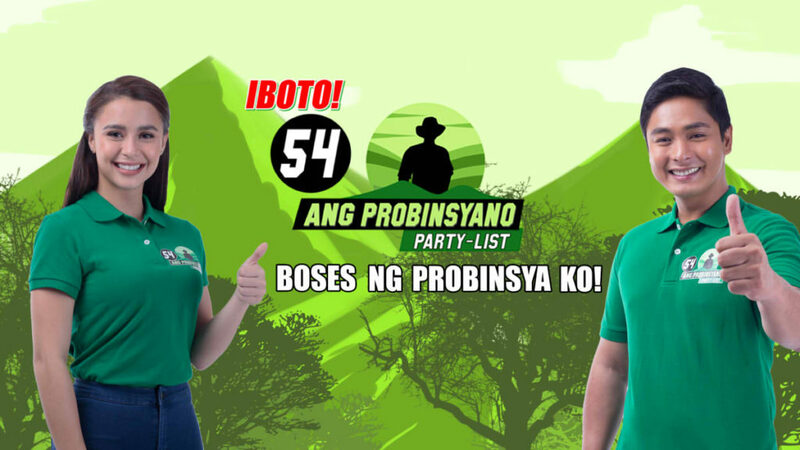 The two celebrities appear on almost all of the party-list group’s campaign materials, featuring more prominently than its policies or even its list of nominees. While the group’s name imply that they stand for provincial Filipino interests, their investment on pop culture and their formation of youth wings tell us that they are also courting youth voters the same way the two aforementioned parties are. But it is rather insulting that their strategy to woo the youth is through pop culture and celebrity starpower, they offer almost nothing in terms of policy or platform. Are they insinuating that the youth will simply vote for you based on name-recognition alone? Surely our education system isn’t that bad. Regardless, it is clear that there is only one party-list in contention for the 2019 mid-term elections that is serious about engaging and helping the plight of our youth – Kabataan Party-list. They offer substance rather than just optics, and present well-crafted policy solutions to alleviate the burden Filipinos bear instead of adding to them. Unless any of the other party-lists match Kabataan’s commitment to youth, they need to cut the charade and concede the youth vote to the progressive party-list group.